New AC Series coming May 7!! 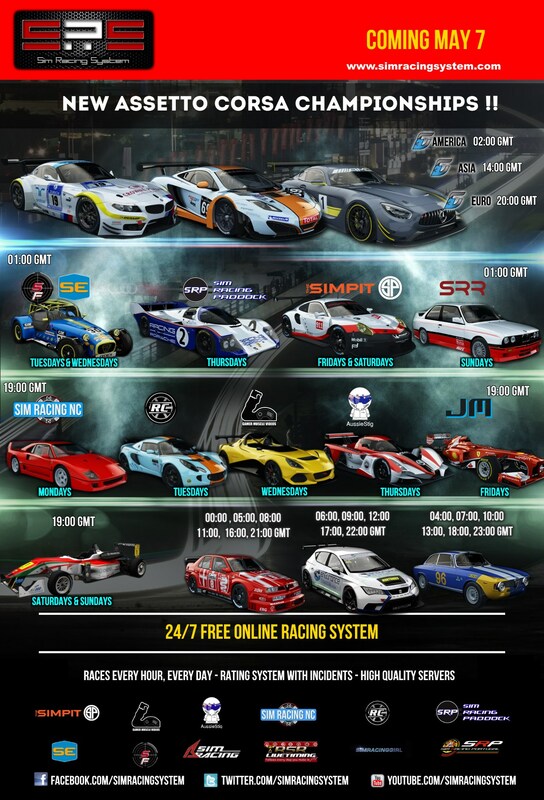 Sim Racing System Sim Racing System News New AC Series coming May 7!! We are very pleased to announce the new series for Assetto Corsa! Fuel consumption:165%, Tyre wear:170% & pit window 00:10 - 00:50. Seat TCR daily series and AussieStig Praga R1 will feature fixed setup. National championships will continue this season and shall be announced monday. The 4th, 5th and 6th countries of the rating table will be awarded a national championship. Thanks Admin! I see the GT3 cars in the three regional hour long championships are back again. So is it safe to say or assume that it just goes round that order? We just went full circle yeah? Looks like a fun set. I like that SE and SimForce are doubling up on the same car. Should be awesome! I'll request this again this season, as someone who does not know every car in AC by sight. Can this get added to the details for races at some point in the future? The graphic logo in the top left is cool, but for series where there are multiple cars and some of us are video game nerds and not gear heads, it's a nice QOL addition. Absolutely 2nd this, its hard for me to work out what cars are needed. I would suggest having the car in plain text below the graphic. Also some kind of spreadsheet/list as well as the poster, please. I made this for the last series and probably made mistakes but surely all this exists in a list somewhere already ? Thanks for an amazing service ! Great selection of cars. Love the touring car theme for the dailys. Alot of people will be happy to spend more time in the Seat TCR. Is it a DTM series or is it just the Alfa 155? Again just a picture is not really clear. IDM as I would drive the Alfa anyway but I am sure anybody who prefers the M3 or the 190E is going to be wondering about this. 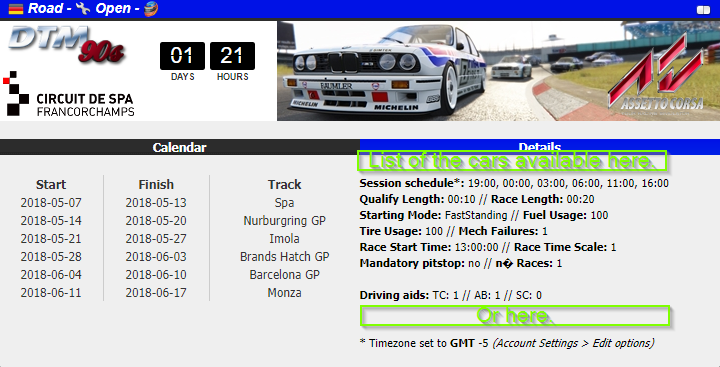 The upcoming series page refers to it as DTM so i'd assume it's all three cars. Nice to see the Caterham featured, too bad it's in the US timeframe. I hope that the DTM is all three. Just for clarification which Ferrari F40 will we be using. The standard or s3 version? and the F138 is dead for me too, there will be many unexperienced so many incidents , as we can see in Jordan F1 or F2004 , where it was better not race, because chance for negative points was more then 100%, wil be there any point limit? I'm not great at high down force cars but i'm fairly good at energy management which should be good in the longer race.